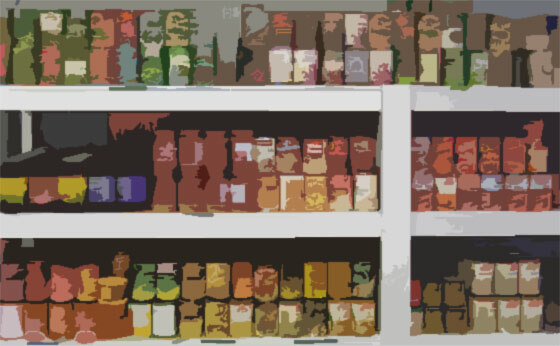 A deep pantry of food storage for survival & preparedness’ is more than just a backup plan for ‘the end of the world’. In reality, there are other practical reasons to have so called survival food on hand – reasons that may actually be put to use! After all, ‘the end of the world’ may not ever happen, right? When’s the last time you went to the grocery store and noticed that the price of food went down? That’s what I thought… NEVER! It always goes up. Here’s a tip: Once you’ve established a baseline of deep pantry food storage, from that point on you have the luxury of replenishing those foods – waiting until they’re on sale. Over time lots of things will go on sale (simply to entice people into the store), so why not take advantage of it when those foods happen to be what you store and eat? A health emergency event for you or a spouse might also cause financial hardship. While your attention is turned towards recovery, you will be relieved not having to make trips to the grocery store or be burdened with the financial strain of groceries for awhile. We enjoy having a large variety of food choices right at home. Sort of like having your own grocery store. The more food and variety that you’ve stored, the more choices you have on a day-to-day basis for what to eat! “Buy what you eat, and eat what you store”. This will minimize eventual waste. Make a habit of evaluating what you have and be sure that you’re actually rotating (consuming) that food. Replace the old with new as you consume it. A good rotation plan is important! What about getting stuck in your home for a few days following a major snow or ice storm? Got food? Fill in the blank for your own possible power outage scenario. It’s good to have what you need at home! Maybe you have enough food to feed others during a time of need. Your choice. Or maybe you would take in some ‘select’ others during TEOTWAWKI – who would need to eat too… Having extra beyond your own needs may be a valuable asset under worst case conditions. Wouldn’t it be nice not to worry about running out of food? (the amount of time is solely up to you). That in itself would relieve much stress during any of the extreme hypothetical scenarios that people prep for. One less thing to be concerned about. I’ve listed a few practical reasons to have a well stocked pantry, beyond just for ‘the end of the world’. Any additional reasons to have a decent food storage inventory? All well said. All true. —It is a huge relief to have “stores” set up. I also very much like being able to wait until whatever item is on sale/stupid cheap manager’s special and stocking up. Mostly I can. Nowadays when I purchase some food item not on sale it does feel like a real treat…something I have bought because I may have a yen for it…Most things are bought on sale/big discount. Food storage is one area of prepping that is a no-brainer. So much of the myriad of items that prepper sites recommend or insist as being absolutely have to have, may never be used by those who buy them. Not true with food. My suggestion on food storage is to buy those items you normally eat, that have shelf lives of three to five years, concentrating on a variety of foods that, if need be, you could live off of them alone, without any trips to the grocery store to supplement gaps in nutrition. This can be done easily with canned meats, veggies, sweets (pie fillings, cake frostings, etc. ), boxed dry foods such as cake mixes, dry milk, flour, corn meal, condiments, etc. Build up slowly to a years supply, and with management, there should be no waste of food that’s gone bad. I never jumped on the pre-packaged freeze dried meals band wagon, mainly because these are something I don’t normally eat and are much more expensive per portion than the foods I do normally consume. If I bought a years supply of them, I could see a time I was forced to eat them just to keep them from going to waste. These are my own personal opinions and in no way are intended to discourage or demean those who disagree. Yes, food storage. Have ya noticed, just how much room it takes to store food? I know, build shelves. Believe me, I have. You have to provide an environmentally controlled space for all of it. You can’t let any can goods freeze. Store bought or home canned, you have to stack it somewhere. My wife is fully on board with “just in case” mindset. She does like to have a clean, organized home. I do too. So what’s to do? I’ve built several frames that allow cans to roll towards the back and then towards the front, (gravity). They work fine in a couple of tight spaces within cabinets. That helps, but is not the answer. I’ve built shelves and installed cabinets in rooms you wouldn’t normally see them. They’re all full and we would like to increase our food storage. I really don’t like the idea of visitors seeing food stacked everywhere. My wife tells me, “it’s ugly.” I tend to agree with her. Besides, no one needs to know how much food we may or may not have here. I’ve considered between the studs of interior walls. There is a lot of room available. It would take considerable effort to make that space readily accessible. Doors, panels, fold out decorations. These are all things I’ve considered. It’s got to be easily accessible or it won’t get used/rotated through. Don’t forget the wiring and plumbing hidden in these walls. I’ve considered the attic, but it’s not easily accessible either. I really don’t want to grab a ladder and climb to get that can of peas. The crawl space beneath the floor? Maybe, but not the best. I may have to build a false wall up against an interior wall. I just don’t know yet. I guess, if it was easy, everyone would do it. It’s just like my garage. No matter how big it is, a man will find plenty of things to fill it. Attics are no good, since they can get really HOT in summer. Garages can vary in temperature unless they are attached to the house and the house’s heating and cooling system. I like your idea of between the studs of interior walls. I have heard of some people storing small items (such as gravy mix, candy, rice, pasta, etc.) inside hollow interior doors. I guess you would need an opening at the top to drop food into, and an opening at the bottom to retrieve the food later. It would sort of naturally be rotated. But you would need something to conceal the openings, maybe a calendar at the top, and some sort of door stop at the bottom. Yea, I got a “fraidy hole.” Mostly used for water storage and tornado shelter. It is far too humid for storage of canned goods. We tried it and found rust forming on the home-canned lids and rings. I do store potatoes down there on screen racks. I also have a metal building, detached from the house/garage. It gets stifling hot in there, during the summer. I’ll figure something out. Good to get the tired old brain workin. Luckily we have a basement, but I want to move the stores away from the furnace, water heater. The area an outsider repairman may have to be. So I’ve been looking for additional ideas online for our new storage area. As you say convenience/easy access is a must. A gravity fed can dispenser is a must. But we have it pretty good with that basement. In my grandparents/parents basement, now my brothers. sump pump, Gramps had a rowboat in the basement to retrieve stored canned goods when it flooded. True story, I kid you not. When I was working I the oilfield, I would sometimes be gone for a few weeks at a time. So when I left to go to the field, I would turn off the heater or AC. No worry about freezing since I was them living in south Texas. But many times when I would come home, it would be in the mid or high 90’s inside. I agree storage for many is an issue but most important is rotation. It doesn’t make any sense to have 50 million cans and packages of food if the majority is expired way past the past due date. In reality, all a person would have is just a few recently purchased goods and the rest shouldn’t even be used as dog food. My grandfather was a perfect example of this. He had food stashed in large quantities all over the house. When he passed, almost every single bit had to be thrown away. Such as canned goods that expired in the 90’s and cans that had rusted from the inside out along with many food packages that were sampled by mice. So he had a gajillion containers of food but would have starved to death in a matter of a few weeks during a SHTF event. Isn’t it George Carlin who had a skit about ‘stuff’. We buy a big house and it is empty. So we fill the house with ‘stuff’. When the house is full we then put ‘stuff’ in the garage. When the garage is full of ‘stuff’, we get a storage unit. And before we know it, the storage unit is full of ‘stuff’. How so true that is for so many of us. You can store about 14 15oz cans and 7 half size cans in one 5 gallon bucket. To stack them all you need is a cardboard round. This is easily totable and somewhat nondescript. We have this with a variety of canned goods as an escape pantry. This really is a very good idea and so easy and cheap to do. It will survive mild below freeze temperatures. How many beds do you have in your house? Good place to store some foods. You can put them in trays so it would be easier to pull out. Buckets can become small end tables with a small table cloth over them. 4 buckets can become a table, maybe for a child. You have to get real creative. One would be surprised how much “Stuff” ya can get into a 20X20′ basement or bunker under the Garage. I am very much in favor of storing food with the money that would otherwise be earning .05% (.0005) in the bank. Inflation is much higher than interest rates these days. In fact, I recently cashed out a small mutual corporate bond fund. The interest was less than the drop in price of the shares due to recent interest rate hikes. And the interest is taxable, while the drop in price is not. Also, if you have some food stored, you can take advantage of supermarket sales. They regularly have one food on sale while the things you eat with it are not. So, one week they will have hamburger on sale, but buns are outrageous. The next week the buns, mustard, and/or cheese will be on sale. If you have no food stored, you wind up paying high prices for at least some of your food. Of course, where I live, we also have to worry about being stuck in a blizzard and most people do a lot of shopping at Walmart — 110 miles round trip — so most of us buy food at least one to three months in advance, even if we are not preppers. When I lived in Montana and worked at Walmart, I could usually tell who was a rancher from out of town. They would have three carts overflowing (before bagging). They would buy six gallons of milk or so along with 10 loaves of bread. They would buy a lot of the usual things we buy, they would just buy six or seven of each item. Then I would see them a month later doing the same thing. How did I know they were ranchers? Well, the cowboy boots, blue jeans, carhart jacket and cowboy hat were the giveaway. Same here. 114+ round trip miles to the nearest grocery, which is Walmart. People who aren’t preppers have food storage. You can’t run down to your local grocer when you run out of something because there isn’t one. do not forget to store water, and canned juices which have long expiry dates. A person obviously needs to drink, and if sick is your shtf, those juices will be needed. For a couple years I lived in a place where the available food was generally poor quality and very expensive. Local bread wasn’t bad, though, just pricey. Purchased all kinds of LTS food, dehydrated and freeze dried. Found out what I liked and didn’t. A good forced experience. Tried lots of ingredients – fruit, veg, cheese, meat, milk. Loved the freeze-dried sausage crumbles. Could not make powdered eggs palatable, no matter which brand or how I prepared them. However used as an ingredient in baking they were fine. Have noted over the years that LTS pourables in glass don’t seem to be bothered by storage conditions. Also noticed I stocked more deep pantry items as the cost of gas went up. Saved on running in to town. No matter your faith, ethnic background or family history there will be a story of needing food. It’s so blatant that’s it’s hard not to accept and even harder for me to understand why others ignore it. It is generational concept that has been programmed into their brains. Depending on the era in which one grew up, living conditions, an financial security of the household. Because of many factors I saw hunger, parents unemployed for a while, money non existent. They saw to it I was fed but it was minimal and they went hungry. Dh’s went through the same thing. Promised myself our household would never live through that situation. Now you have short synopsis of our mind set, we are the baby boomer generation. Here comes the next generations after us who never saw hunger, trained by their parents that grocery stores can be filled with foods from different nations to be consumed. Shopping 7/24/365 walk in purchase what you want, when you want. No worries the grocery stores will be FULL all the time but what they are not understanding is that those food supplies can be cut off any time and leave them hungry. My older sibling and the youngest sibling are of this mind set even though they were raised differently. Reason I used the word ‘concept’, they have programmed their brains into believing all they have to do is walk in those doors and the food chain supply will feed them. Their children are of the same mind set, and no matter what I say it does not compute. Yeah, what I noticed when in China is that they store very little food. A lot of it is due a lack of storage space. The other part is because most of the food eaten are fresh fruits and vegetables. Of my wife’s family, I have not seen one canned good in any residence. They just don’t use canned goods. They do have plenty of containers of food flavorings/spices. The only good they have in any quantity is rice as they buy it in the big giant bags. I regularly “shop” in my own deep pantry. Very convenient and actually a useful behavior to rotate items. Told DH it is a good thing he over-engineers everything, because those shelves are HEAVY with home canned goods etc. We usually buy food products when on sale. We also home can and dehydrate our garden produce as much as possible. Inflation has been growing at a fast rate the last few years so buying food stuffs is an investment in something we need . Finding the space to store items can be a little challenging at times , you just have to be creative. Cool, dark and constant temperature is the key . We try and have items out of sight . Loose lips sink ships. Remove the kick plates under your kitchen cabinets stock with canned goods then remount the kick plates with screws. Rotate cans every 2 years or so. This is an excellent secrete food cache for your home. If you have a 6ft. base cabinet run that is a 2ft. x 6ft. (12 sqft.) area to store canned food. I have a extra wide kitchen island and store many pounds of canned meat. Food storage allows you the luxury of keeping more of your own money AND time. When you have sufficient food put back, you can time your purchases to only buy when on sale and spend less time shopping. I can choose to cook or bake almost anything and never have to run downtown to get an item because it is already in my storage room, frig or freezer. This comes in real handy when I need to create a meal, casserole, or baked item for someone in need or for a funeral….or even unexpected guests. Sunday night I was able to throw together a peach cobbler for a last minute get together to play cards. I agree with the where to store issue. The deeper the pantry, the more room that is needed. I am fortunate to have a dry basement (when the refrigerator doesn’t leak anyway) where I can store my items safely and at a steady temperature. I still must be alert for mice though as the heavy wet this past year cause vermin to move inside for the first time in years. I store everything in glass, cans, or pails and Rubbermaid containers using Mylar in the plastic so that saved me a lot of grief when I found the evidence of the rodent. And since the leak, I am more careful about overhead pipes when placing shelving. I believe Ken hit every reason why food should be stored. And I can personally say it won’t cost you more to store food if you buy foods you can eat that you prepare. Don’t fall for letting the manufacturer prepare your food that contains all kinds of stuff your body doesn’t know how to process. Get back to the basics, buy in bulk and break it down into usable portions, and get with local CSA or farmers for your products that you don’t grow or raise. You will be healthier as well as achieving peace of mind. I also believe in a full Deep Pantry, although I don’t count the Deep Pantry into my Kitchen “stuff”, to me it’s a separate “store”. Meaning when I use something from the DP it’s added to un-counted items in the kitchen. Hence I would recommend to everyone to keep a detailed ‘Inventory’ of the Deep Pantry, including dates (Best By) and cost of each, among other info, mainly in case amounts AND the location (under house, Garage, Storage Shed, SO-On). When something is taken from the DP to the Kitchen, mark it on the Inventory and replace it when on sale; ONLY when on sale. This Inventory should also have a Minimal and Maximum amount you want to store for each item. BTW, Inventory all the DP stuff, including Cleaning supplies, Laundry and Paper goods, Fuel, Ammo, So-On. One might also have a column on the Inventory of how many are used during the year; this will help you realize the number needed in the Min/Max columns. I am currently in the process of cleaning out my pantry to get a better handle on what I have in the kitchen. Our local store (very local, basement pantry) is much more organized. I can see what I have on hand at a glance. The kitchen however is another story. After the Paprika fiasco, I realized that I have to re-organize my pantry and cabinets better to avoid a repeat blunder. Many homes don’t have basements, many households don’t have the extra room for food storage in an appreciable amount. Don’t overlook the crawl space under your home if you have a pier and beam foundation. This area tends to be cooler in the summer and warmer in the winter than outdoor storage sheds. Of course, it tends to have more insects and rodents also, so sealed 5 gallon pails would be in order. Hate to admit it, but probably 80% of my Deep Pantry is in the craw space as you suggested. DONT store any fuel or things that go Boom under there. No “Booms” under the house? you’re no fun. If my ammo cache ever went up, it would be the stuff of folk lore for years. Maybe you oughta’ think about splitting that into several caches? We usually had more than one main powder magazine underground, for safety and convenience. I kinda do. I keep the majority of it in the main house, but substantial amounts stored in each of my two cabins, one of which houses my reloading equipment and components, temperature controlled. Each vehicle, including my side x side utv carry at least one ammo can with spare ammo for my main edc defensive weapons and modern sporting rifle for travel away from home. Did you verify that the Neotoma cinerea was organically raised before you lathered with the JD sauce? Yeah, the noise they make when banging the silverware on the table is pretty obvious. Around here, I seem to have Sigmodon hispidus running wild and free. Maybe I need to fire up the grill, LOLOL, Any particular BBQ sauce you recommend? Personally, I’m partial to the Budweiser sauce! I have a recipe for Jack Daniels BBQ Sauce that’s really good, will even cover up the taste of Deep Fried Skunk. – DW says she can’t eat those, (Cotton Rat), they are too cute. Look like Guinea Pigs with a long furry tail. I’ve been cleaning up with regular rat traps. I came across a recipe from BB King for BBQ sauce about 20 plus years ago. It was really good. I have to find it. The wife and Daughter went crazy and bought 25 slabs of pork ribs on sale the other day. – from Cotton Rat Control,”The main defining difference in cotton rats among the rat species is their herbivorous diet, in which green grasses and plants are eaten, and the fact that they do not carry diseases like many other rats, though they are able to transmit the HPV virus on their fur. They have an exceptionally high immune system and are otherwise safe and are researched on this principle”. Better than Pack Rats? LOLOL. Ok since this is an article on “Food Storage” How do you plan on storing all those Ribs???? Well,some will go in the deep freeze. Some in the house refrigerator. And God willing and the creek don’t rise a whole bunch will get stored in my tummy this weekend. I think about this. Ninety meals a month for one person. 1080 meals a year. For just the two of us that is 180 meals a month and 2160 meals a year. If I have DS, DiL, and GD arrive it becomes 450 meals a month and 5400 meals a year. That is a LOT of meals! The freeze dryer is terrific. The foods will last about 25 years. I just keep aiming for that 5400 meals. I rarely use my freeze dried foods. I just keep adding and adding. If I start thinking about the numbers of meals or the numbers of calories it gets overwhelming. So I plan on having 25-30 of each type–enough for one meal per day for a month. So 25 beef stew and 25 chili and 25 Beans and ham, etc. Same with the breakfast stuff. Three meals per day for two people doesn’t look nearly as massive in that case. I can wrap my head around 25 or 30, but not around 5400. I too have a hard time wrapping my mind around that many meals and calories. Planning meal ingredients for main entre’s has been my best option for keeping variety in our diet. We already have food fatigue..going thru several weeks of..”.I don’t know what i want, but it is not here”. Having things for snacks…ie. beef jerky, pork jerky,peanut butter, boiled eggs, leftover biscuits/gravy/rice for the meal in between, or the late night snack. )will make this possible to stretch 30 hearty meals (of canned food in qts) w/ breakfast foods into 30 full days.Having the ability to not be so tightly portion controlled that people are hungry when they are only 90 min past eating. Using 10 main meals from 3 main meals..in rotation, eggs/sausage/bacon from supplyx20+ alternative breakfasts for 10 days) 5lb cup ea of flour, /wheat/rice/cooking oil /salt/sugar.(2lb). will give filling and to spare for the 3rd meal. When cooking our meat I often do this as a springboard for next meal. I will eat one pork steak, DH 2. the 4th I take and slice and use as part of stuffing for a baked potato.for 2. the main entre for that meal.Served with a canned or rehydrated vegetable. is enough. Average person uses 100 rolls of TP a year, that’s 500 rolls for your group….. For one year, all alone the 25 years that food will store for…..
Maybe not “Food Storage”, but a well needed commodity for sure….. Yes I know you all think I’m NUTS, but one has to think about the entire “What/If” when talking Deep Pantry and EOTWAWKI. How a way to cook all that food? Do you have a means to cook 450 meals a month? That’s a LOT of charcoal for sure…. The logistics of this Preparing Thing is staggering for sure. Most is canned/bottled, so no need for cooking if fuel is scarse. For the rest, solar oven and maybe a wonder oven to decrease fuel needed and massively increase cooking time. : ) That would be an interesting additional post: Alternative cooking options. You need to set up your BOL close to a coal seam someplace, that way you will always have a good source of fuel in SHTF. Forests are nice too, but after a while, they tend to get thinned out. Oh dear! I have taken your advice and have quite a bit of tp stored. I find the commercial sized rolls (as found in restaurants) the best space savers. I also have a travellers bidet just in case, although I think everyone would like their own. If the situation is long, long term each person will have their own roll to encourage thriftiness. As for cooking I have the Butterfly Kerosene stove Ken recommended and am building up my stock of kerosene. I also have a two burner eco zoom stove and fifty acres of forest. When the snow is gone and the solar system is done I have a hot griddle. Pretty good all in all. But, yes, it can be overwhelming. Sorry. I meant to say induction cook plate. They take less energy than a stovetop. So, your 600 roll stash is only just over a years worth of TP. Yeah, it can get pretty deep at times. Good point on the fuel etc for cooking so many meals, even if you simplify to 3 meals a day that is still 1,095 meals a year, if you use 30# of wood to create the BDUs to cook then clean and sanitize your dishes and utensils that is 32,850# or 16+ tons of wood, the 30# is conservative too, in reality it might average out to that if you only wash up once a day, but that isnt real sanitary. Add on to that the extra wood needed to heat your living space, boil water for cleaning clothes, or bathing, realisticly if wood was the primary fuel source you would be looking at a whole lot more than what anyone really thought they would need. Definitely worth giving some solid thought to and doing some numbers, one thing that comes to mind is the method of cooking and the eficiency of the unit and process, one of those stacked type cook stove/oven/heaters with coils added yo heat water might be a solid investment, Lehmans sells them, are a good all around unit. Cooking over an open fire will waste huge amounts of fuel. Of course eating raw veggies is a good suplement as well, but be very aware of sanitation and such. Sort of back to a statement I made before. There is a LOT more to being prepared than food and water. If people cant imagine going back to the 1700 and living like that, maybe they should really think on it. Of course ya have to outlive the hoards and all the rest of the ciaos first. Tommyboy, perhaps a basin with water and tablespoon vinegar is used just to wash the veggies. Then can be used to clean something else at end of day or next day. that’s why you need to look at rocket stove technology. It will save (literally) tons of wood. You can make one to cook/bake with and heat with all in one. They have built alot of them in S.A.
due to the shortage/cost of wood. They are efficient and put out alot of heat. I have made individual burners out of 5 gallon buckets to cook on. My grandson and I converted 3 gas water heaters to rocket stove style burners to heat the water. Really wasn’t that hard.we have them at our central bathroom/laundry area. There are some very cool designs on you tube. Have used in the past, and are VERY easy to build. I think you missed the fact that when weather is cold, my wood stove is already on 24 hour duty. I can heat water, cook, etc, at no extra “cost” as well as stay warm. I like the rocket stoves. They are a simple design that you can make. They can be made from everything like bricks, stove pipe, even from tin cans. My oldest grandson and I once made one from an old coffee can and then cooked breakfast on it. That was a good time. I usually leave a little freeze dried to rehydrate right after the cycle just to taste. Most of it can be eaten crunchy. Would need liquid to wash down with of course. I just keep adding also. That is the point of the freeze dryer. Buckets and containers add up quick!!! A lot of the above has been said before but it does need to be repeated every now and then. I will admit I’m not the most organized person of this group. Consequentially I really don’t know how much food I have. I do know it is a lot more than the average household. I estimate that I can feed my extended family for a bit over a year. Like Dennis, I don’t have much in the way of freeze dried foods. Maybe eight #10 cans and 60 or so pouches. For those of you new to this you need to look at the calories listed on the serving sizes on both the cans and the pouches. An advertisement that says 90 servings is frequently thought of as a 30 day supply for one. It is not. Realistically it’s probably more like a week when you start counting the calories. The problem with freeze dried as I see it is you are paying for a lot of empty space in the food. It just takes up to much room in the storage areas. On the storage. We have a large pantry in the garage but that isn’t the real storage. Garden shed in the back isn’t for the garden although the rakes, shovels and hoses hanging on the outside might make you think differently. If you are going to use a shed remember white is the coolest color. Technically white is the absence of color. Dark color absorbs heat. We used to have a sailboat with a blue stripe on the hull. On a typical day that part of the hull got so hot you wouldn’t want to hold your hand on it. Yet the white painted part of the hull was cool to the touch. Sheds will be cooler if painted white. Roofs need to be considered also. Galvanized reflects heat whereas shingles absorb it. Galvanized is also better for collecting rainwater as compared to shingles. White rice should probably be the staple for carbs in storage. Brown rice goes rancid. White doesn’t. We had a boat in storage in Mexico for 5 or 6 years. Food was on board. I can only imagine how hot it got inside. Out side temps hit 120 degrees F. The dried beans were probably edible but I would have only ate them if I was starving. The pasta tasted a bit off but was palatable. The white rice was like it had been purchased yesterday. Cans were fine, plastic bottles had expanded and leaked. On the cooking we can cook with electricity and generate same for 6 months. We can also use some of the propane for the generator for cooking and also have the wood stove and an old cast aluminum barbecue grill that is now a wood burner. As all of the regulars know pressure cookers are much faster than regular pots and pans and are not only for canning. Thermal pots keep cooking after removed from the heat. Typically we cook rice in ours. Bring it to a boil, turn the stove off put it in the outer pot and leave it for 25 minutes. Thermos is the gold standard with the thermal pots and we have several makes. Nissan used to be the best but they stopped making them. The Thermos is identical. They cost more but IMHO are worth the added expense. I’ve mentioned in the past that rice will keep up to 3 days without refrigeration. lately we have been using Walmart rice and it doesn’t hold up as well. I find I’m tossing it after 2 days. I believe it was Cal Rose that I was using before and will go back to that when this bag is done. Many of you have heard about the Amtrak train that was stuck in the snow for a couple of days in Oregon. That blizzard knocked down trees and power lines and left tens of thousands without power. As of yesterday 4800 homes were still without power. Restoration is taking longer than usual as trees need to be cleared off of the roads before the crews can get to the downed lines. I kind of think many of those folks will be better prepared next year as experience is a great teacher. Me, I do use FD veggies in my pantry and cook with them on occasion when I need to make soup or stew in hurry or want to try a recipe with them instead of fresh. I think they have their place in our LTS pantry as it may be difficult to have veggies growing at some point in time…they are a good backup. But I only buy the basic FD veggies that I feel are critical and only when on deep discount. This means carrots, peas, corn, celery, peppers, cauliflower and spinach. Onions and garlic are spices to me added to most everything so those are on hand FD also. Potatoes are stored as FD dices and buds. These are to supplement what we grow and freeze or can. I also feel we are going to be eating lots of soups and stews when things go bad. Perhaps some casseroles as well. The potatoes, rice, pasta, and grains will add the needed calories but the veggies bring us the vitamins needed. My grand mother uses a sharpie to mars the expiration date on all her cans and packages. Big numbers keep you from not seeing a can that gets miss rotated. I am not to proud to steal an idea from the elderly. I do the same thing with a numbering system like this….If I buy something in March 2019, the number on the top is 93 (nine for the year and three for the month). If I’m using expiration dates the same applies, but put a capital E in front of it. It helps with rotation if the storage gets mixed up. January is 1 all the way to October is 0, then for November and December, I lump them together with an “A”. I avoided using a “B” as it might look like an 8…. We have a spare bed room that has shelves all the way around the walls. We store everything from food and spices to tooth paste and laundry detergent. We stock the things we like to eat. We tried some of the freeze dried stuff and didn’t care for it. We store regular groceries that we use all the time. DW used to work at the local grocery store and we were able to stock up. She knew what was going to be on sale 2 weeks ahead of time. When meat got close to the expiration date it was marked half price and employees got first chance at it. She lost her job a few months ago when the store closed and our pantry shows it. Not only did we lose her paycheck we also lost our access to good bargains. There is no grocery store in our town now. There is a dollar store but the grocery section there is not very good. The nearest grocery store is 15 miles away and we don’t go there very often. We have a garden and freeze and can as much as we can from that. I will be expanding the garden to make up the difference. It has not been teotwawki but I am very grateful for the things we have stored because they have helped carry us thru some tuff times. Been there and done that…loosing access to bargains is a hard one to overcome- especially on meats. Even if the $ store does not carry s much or variety of food you want. They may order you selected things by the case if you ask. ie.. Dollar general does. I order meat tenderizer from them.each case is a 6 pack. (no msg) . Dollar tree has a ship to store option one can order on line and pay and pick up at local store with no shipping cost. Must buy in case lots.And it will not be put on the shelf.IF you prepay and request a case of an item. Knowing when the local grocery has specialized sales ( 3 day sale?) or sales ad’s changes..can help you save more $$. Hard to beat the Dollar Tree pasta. Pagasa brand is 24 ounces for a buck. Broad noodles for casseroles, and elbows for mac and cheese. But for storage you can fit a heck of lot more spaghetti in a 4 gallon square bucket than you can macaroni or broad noodles. For those with Grocery Outlets near them they frequently have bargains as good as Dollar Tree. They also have an email flyer that you can sign up for. Mentioned something a while back, but will throw it out there again….when buying pasta, the thinner stuff like angel hair cooks much faster than the heavier ones like bowtie pasta. Almost half the time! In a SHTF scenario, this might save on cooking fuel…. Car Guy, consider adding some FD meat to the larder if budget allows. When the meat is put in a soup or stew it is ok. Mountain House taste pretty good with Emergency Essentials coming in next. Make sure it is not meat substitute. Some companies only have that, Wise comes to mind. My husband built a custom queen sized bed frame for our grand kids guest room. There are 24 five-gallon buckets inside! They have a sheet of plywood on top of them, and the mattress is on top of that. It’s all hidden within the wooden “box” bed frame and they hold about 800 pounds of various grains. Looks cool, too! Goatlover, that sounds awesome! I really like that idea. Living in the DC area, it was amazing to see what happened during the government shutdown. People were panicking because they weren’t getting paid and had no food in the house. There were actually some food drives to help these people, and some local restaurants offered free meals. My parents lived through the Depression- we were taught to be prepared. The LDS food bank has a good supply of prepackaged food in #10 cans with a 30 year shelf life. It is worth looking in to. Food storage is just cheap insurance to me and good common sense. I keep mine in a bedroom that was only use twice a year. Take a good look around things are getting bad in the US and around the world. We are considering adding on a room with a basement. Will look just like the crawl space with a trap door under a rug. I want to put grow lights in the upper room. Oh and want to mention again. If possible do not buy Wornick MRE’s. Awful. If they cannot make macaroni and tomato taste good I cannot imagine what the other food taste like. They add some odd spice flavors. The corn nuts were good and that is about it! – On a serious note, the prep that has saved me and mine most often is a deep pantry. Missed checks, sent to the wrong state, even Chernobyl (we were in the fallout zone). Having food and clean water, boxed UHT milk for Chernobyl, and not having to go out for whatever made a huge difference for us. We have been snowed in, had gas lines and power lines cut, and got by with minimal disruption more than a few times. glad he was ok, and making do. Hope he sets up some plans for communication to call for help, etc…But…good he had enough stores to “hang one”.